The annual Prize Giving evening was held at the school on Thursday, July 7, 2017. Representing the club were President Gail, Brian Rogers and Howarth Higgs. I (Vas) was also there in my capacity as a Governor. 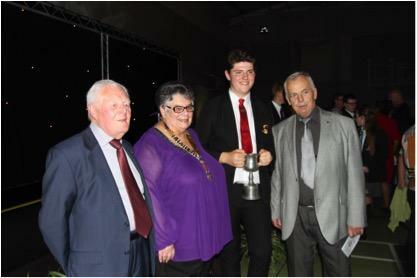 The Chief Guest on the evening was former pupil of the school, Kieran Bedford, who is now a Flying Officer with the Royal Air-Force. 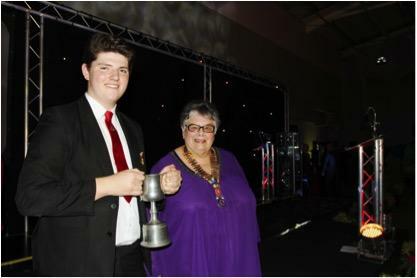 President Gail presented certificates to all the nominees for the Rotary award and the cup to Daniel Barber who was also named the Head Prefect for the ensuing year. She was presented with a bouquet of flowers for her efforts. "Daniel contributes to every area of the school, he is 100% reliable and takes on a range of responsibilities that he carries out with great efficiency and a happy demeanor. Out of school he studies drama and and is in an explorer group, spending many weekends camping and walking. Academically Daniel is a very able pupil and will I'm sure he will go far in the future. He hopes to carry on further study in Computing and Maths after year 11."